#16 Non-Stick Ice Cream Scoop / Dipper- 2.5 oz. 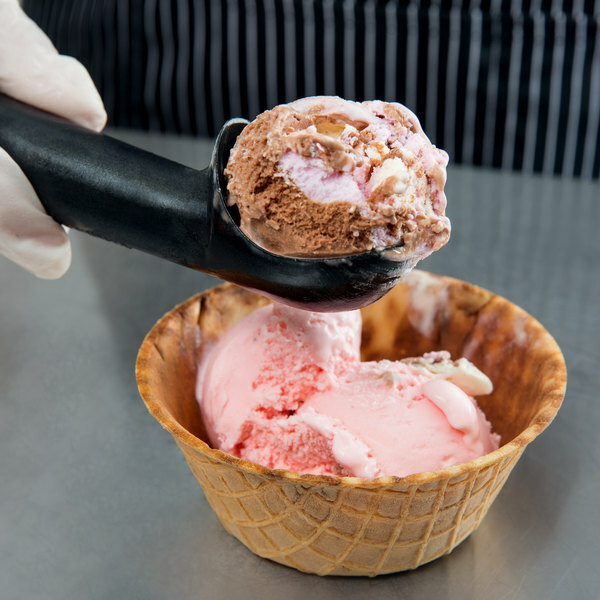 What is the difference between a disher and an ice cream scoop? Dishers are designed to control servings of soft foods, such as mashed potatoes, applesauce, or steamed vegetables. Although these are not meant for harder foods, such as ice cream, they are versatile tools that can be used for portion control in both prep and service applications. Ice cream scoops offer the durability necessary to scoop hard, frozen foods, such as ice cream. Both are traditionally sized by the number of scoops per quart that they can produce; however, they may also be sized by the number of ounces they hold. 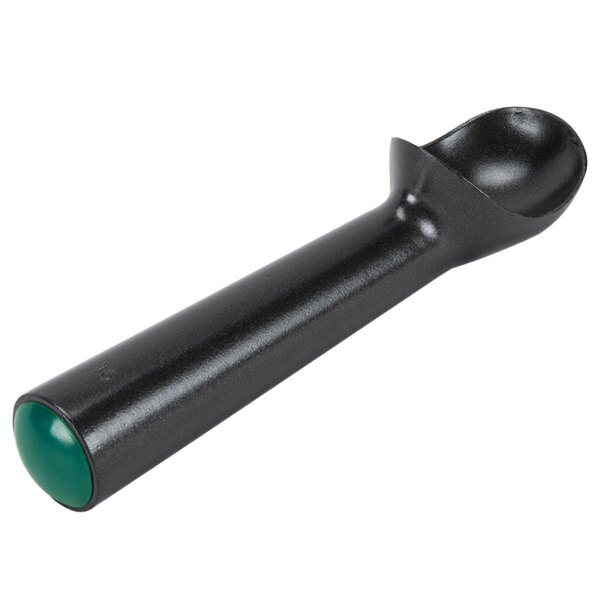 Dishers feature an easy-to-operate thumb press or squeeze-handle design, complete with a quick-release component that ensures no food is unintentionally left behind in the scoop. Ice cream scoops on the other hand, do not feature any movable components. Use this #16 ice cream scoop / dipper to quickly and easily dish up the flavor of the day. Don't struggle when scooping ice cream and make customers wait any longer than necessary for their frozen treats. With this #16 non-stick ice cream scoop, serving up dessert has never been faster, easier, or more convenient. Holding approximately 2.5 oz., this dipper is the perfect size for portioning out scoops to create single portions or for dipping multiple flavors to fill one cone! Designed for scooping hard ice cream, this scoop features a non-stick coating that helps ensure smooth rolling and easy release of your patrons' favorite cold treats! 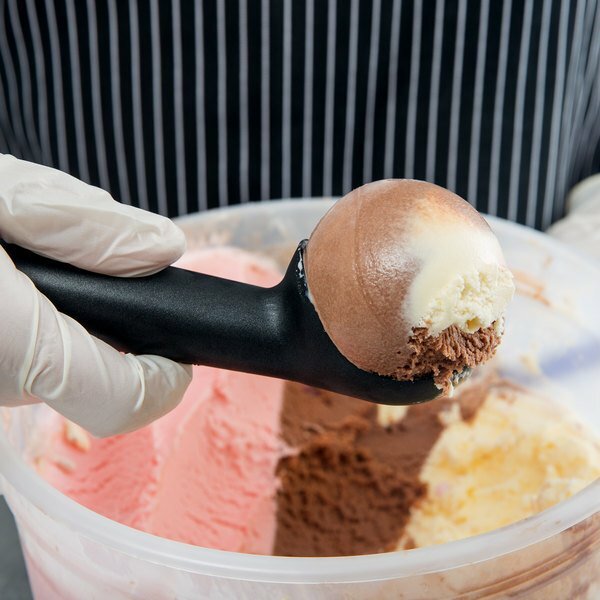 This #16 non-stick ice cream scoop is easy to clean and helps ensure a consistent size for each scoop, while helping your employees serve ice cream faster. It also features a defrosting handle that makes scooping ice cream easier and more efficient. Plus, the defrosting handle also helps to prevent ice crystals from forming on the scoop in between uses. Dish out tasty, classic-shaped ice cream scoops with this #16 non-stick scoop. #24 Non-Stick Ice Cream Scoop / Dipper- 1.5 oz. #12 Non-Stick Ice Cream Scoop / Dipper- 3 oz. #16 Aluminum Ice Cream Scoop / Dipper- 2.5 oz. Overall User Rating: #16 Non-Stick Ice Cream Scoop / Dipper- 2.5 oz. This is the perfect size scoop for my restaurant hand dipped ice cream. It never sticks and rolls the perfect size scoop Everytime. I will be ordering one for every flavor we carry. While this wasn't a great choice for high volume ice cream dipping, it makes a purfect cookie dough scooper for making homemade cookies. They produce a consistent adaquate size cookie that we provide to our customers that purchase lunch at no charge. Highly recommend for this use. Excellent ice cream scooper at a phenomenal price. I love this company and they are by far the cheapest anywhere. I love all there products. Below wholesale pricing!! Standard Ice Cream Scoop/Dipper. Works very well. Solid construction. Very good Value for the money and would recommend to anyone looking for a quality ice cream scoop at a good price. 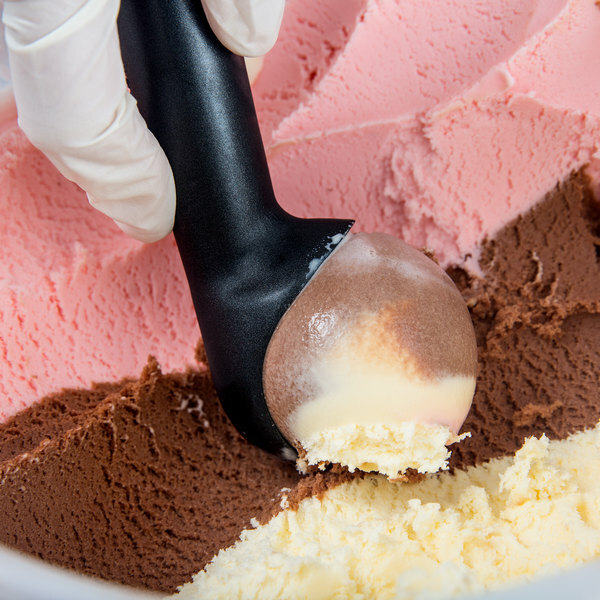 The #16 Non-Stick Ice Cream Scoop/Dipper makes the perfect sized scoops for ice cream cones. The non-stick scoop is great! It is sturdy and the ice cream doesn't stick to the scoop. The absolute only downside to this scooper is that it isnt dishwasher safe. Other than that, its design and functionality is absolutely flawless in every single way. It's one of my favorite scoops. i have been using this scoop for years and years and it's just as good as I first bought it. Good, solid ice cream scoop. I would say this is about the standard size you could buy at the store. I prefer the non-stick scoops because my stainless steel scoops have tended to get build up or some weird deposits on the inside of the scoop. These do not! The size is great for scooping ice cream into a cone. I do not care for the non-stick coating. I prefer the regular scoop over this one. The Teflon coating on these scoops make them easy to use in our high traffic ice cream shop. The scoop easily creates rounded mounds of ice cream in the cup or in a cone! Oh man I love these scoops!! It makes scooping ice cream super super easy!! I don't think I could say enough good things about this scoop. The ice cream doesn't stick just like it's not suppose to do. I highly recommend this to anybody! This #16 non stick ice cream scooper is great for scooping a perfect sphere of ice cream. It is easy to clean, I wouldnt suggest running it through the dishwasher. This scooper is wonderful for scooping sherbet, sorbets and ices because it releases so easily! We highly recommend this for your business needs, and we use ours everyday! I wasn't sure when I ordered this if it was the size I was anticipating or a little smaller. It's a little smaller - the kind of size you might use for a kiddie scoop or a dessert that has multiple scoops of ice cream or sorbet or something rather than the size you might use for a single large scoop of ice cream. Of course, that is a good thing in terms of portion control. This is less than a third of the price of the nearest competitor and it's beautiful too- it's great to be able to find a sleek black one like this one - not very commonplace. The non-stick ice cream scooper works very well. It is easy to use and scoops the appropriate amount of ice cream each time we use it in our store.